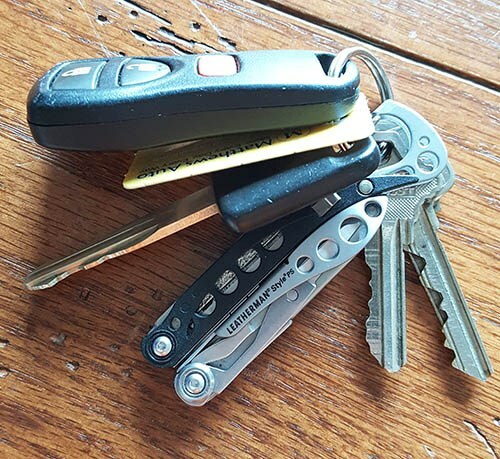 The Leatherman Style PS is the multi tool of choice for anyone who likes to carry and travel. TSA compliant and super versatile, the Style PS packs a punch with 7 tools; spring loaded pliers, wire cutter, bottle opener, file, screwdriver, scissors and tweezers. 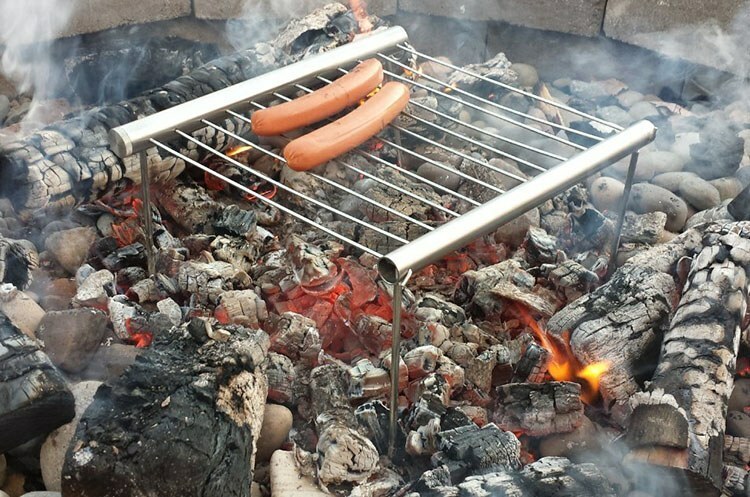 It lacks a blade so you can carry it on a plane. 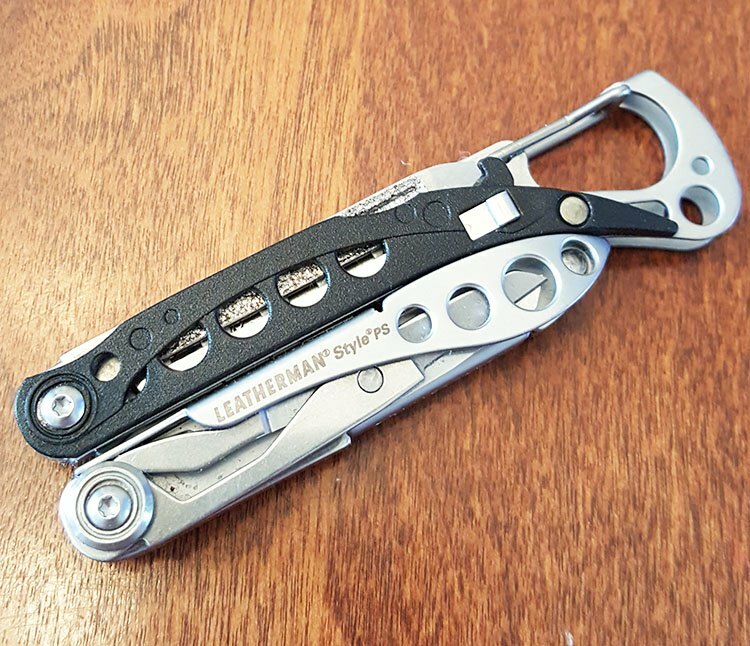 It’s a great value at around $25 and Leatherman is known for making quality gear… in the USA. They back the Style PS with a 25 year warranty so hang on to your receipt. 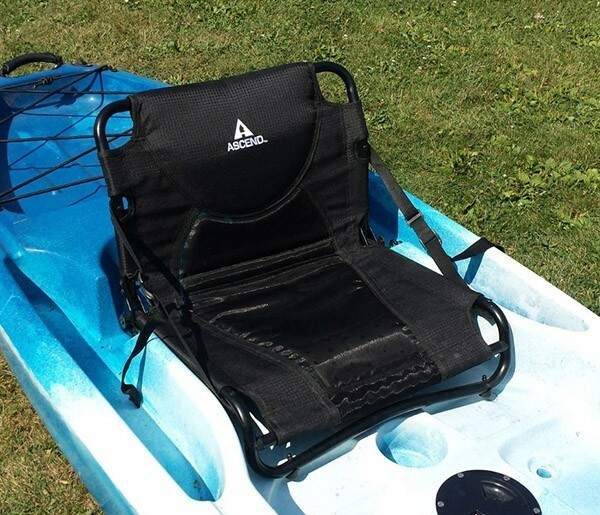 The frame is a combination of stainless steel and a thermoplastic nylon/fiberglass which is rugged looking, super strong and keeps the weigh to only 1.6 ounces! 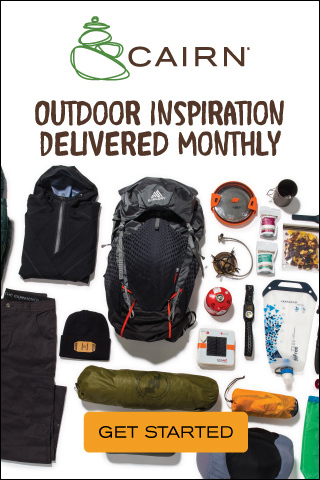 So light, you’ll probably forget it’s there. Dimensions. Measuring 3 inches x 3/4 inch x 5/16 of an inch – it’s pocket size. Most of the negative online reviews of the product were from buyers who thought it was going to be a full sized tool, which it isn’t. 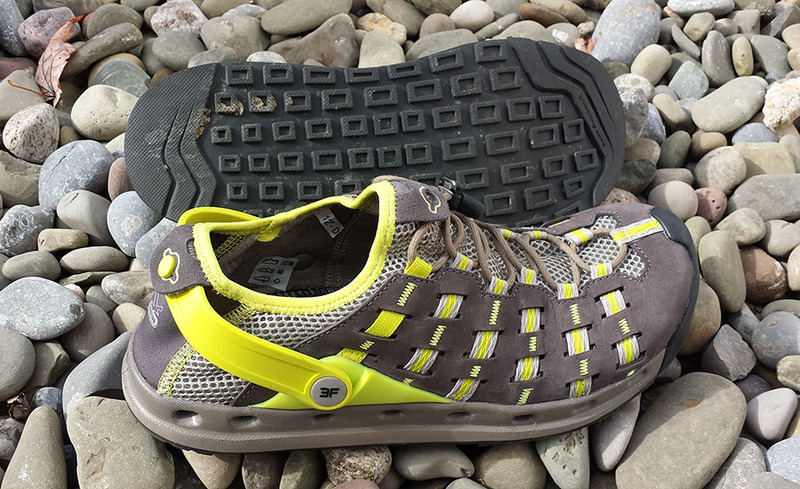 Clip it anywhere. 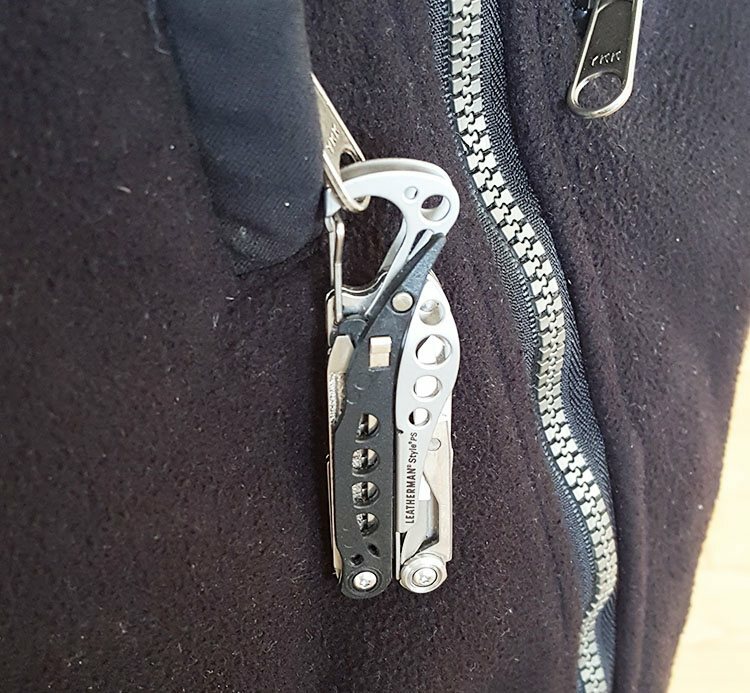 The carabiner/bottle opener clips to a belt loop, fishing vest, key ring or zipper and holds strong so no worries about losing it. 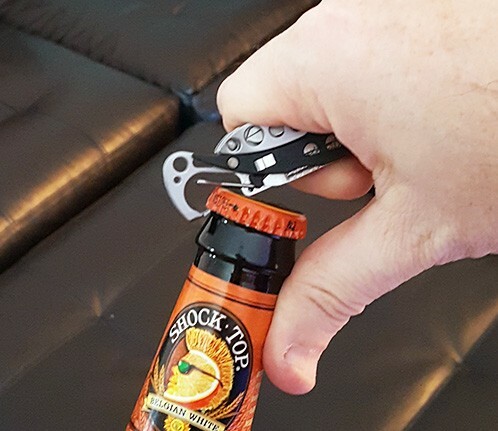 Pop it off to open your beer and pop it back on, it’s right there when you need it. 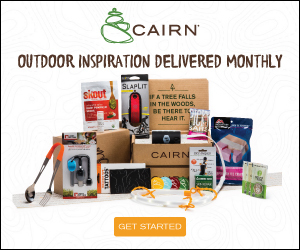 The 7 tools are easy to access and use. It’s packed with spring loaded pliers and wire cutter, bottle opener, file, screwdriver, scissors and a set of small tweezers. 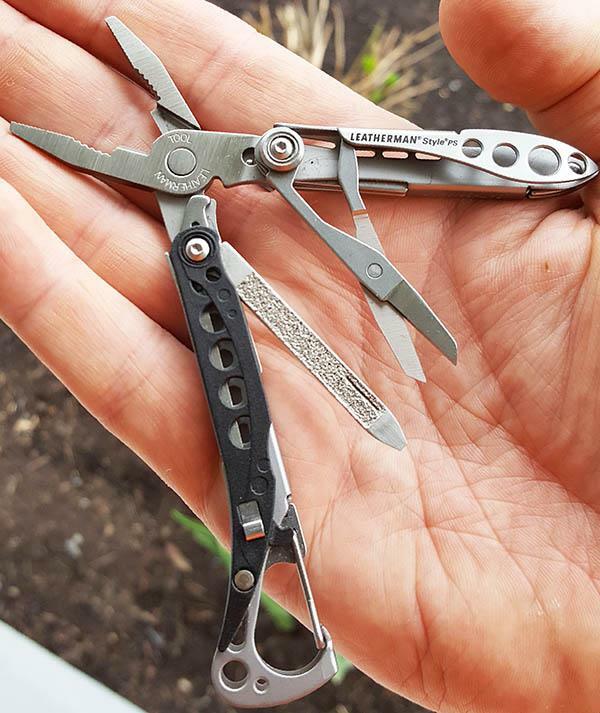 Even when all the tools are open it still fits in the palm of your hand. The scissors and screwdriver/file are located on the outside of the tool giving you have a solid grip when using them. I’ve found this especially useful when needing some extra torque on the screwdriver. Spring loaded pliers have a knurled jaw with a wire cutter at the base. 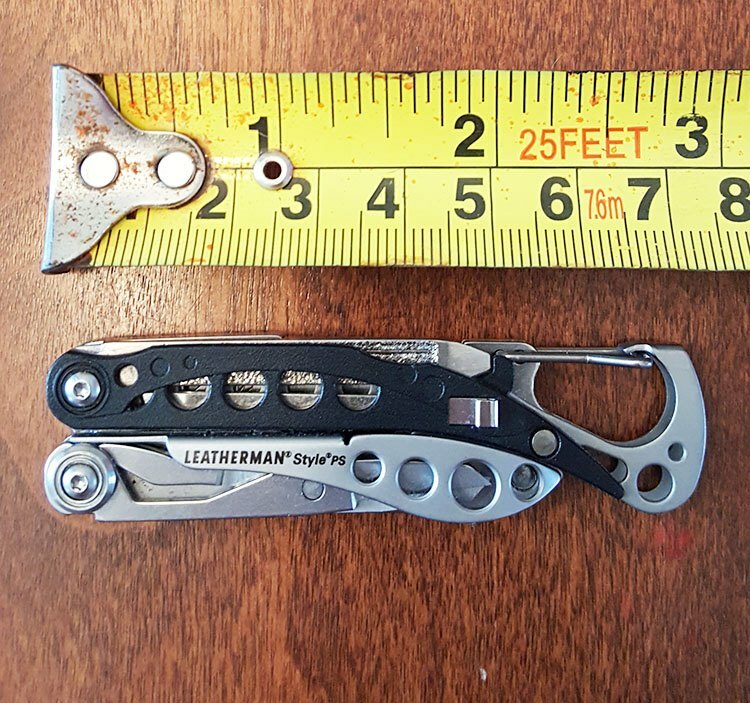 You can get a solid grip on small items that measure 3/8’s of an inch or less. The wire cutter at the base is made for light duty and great for fishing line, plastic or thin wire. Tweezers. Small and sharp they’re great for removing splinters and if you have a set of ham hands like me, for picking up small stuff like screws and other hardware when you’re fixing gear. They store very tightly on the handle and have never fallen out. Unless you’re looking for them you probably would never know they’re there. Scissors. 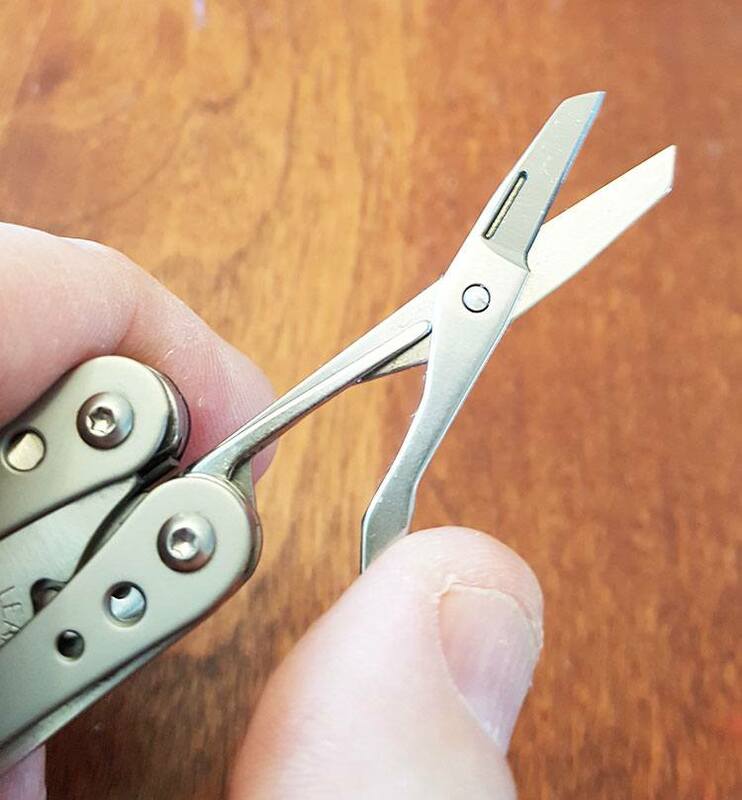 As with most multi tools the scissors are basically useless, they don’t stay sharp and break with any real pressure. They are what they are and come in handy if you have a loose thread you need to trim, or opening plastic bags. 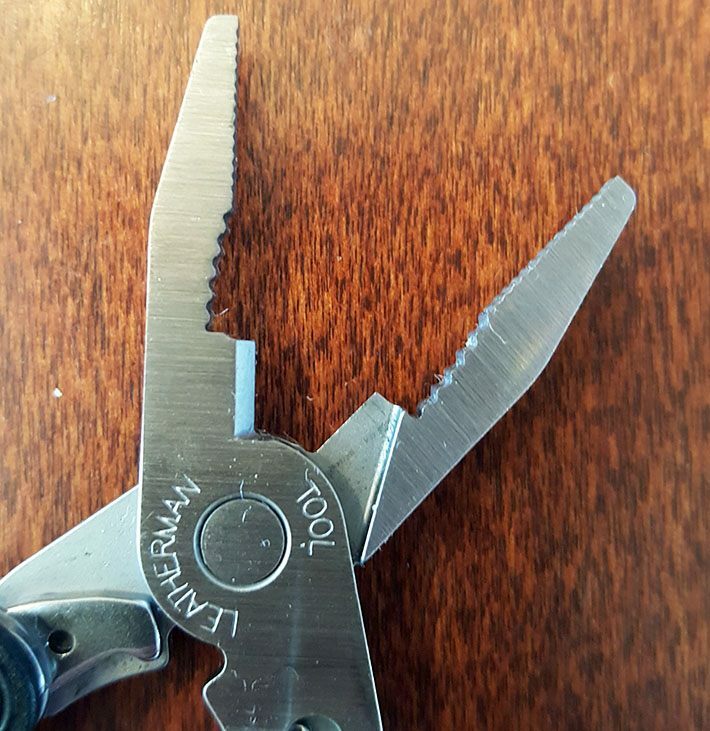 I wish Leatherman would do away with scissors altogether and give us something that’s more functional and durable. Bottle Opener. 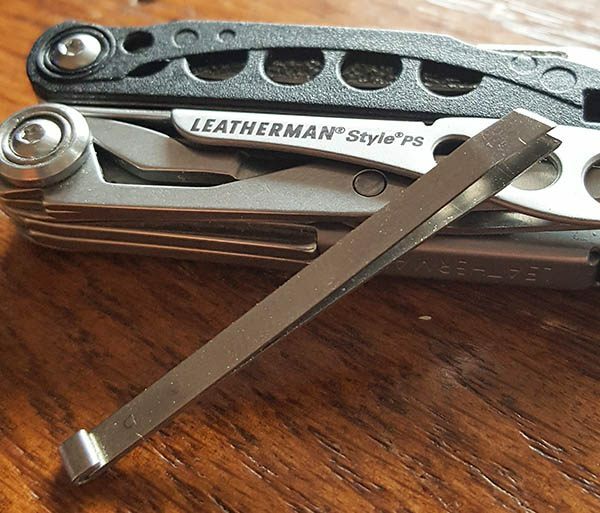 Arguably the most important tool in the Leatherman Style PS arsenal. It can open almost anything with a narrow claw that gets under any bottle top. With no blade the Style PS is compliant with TSA regulations. However, you never know who you will get at airport security. You’ll find just as many reports of people sailing through security as those that had their tool confiscated. Even when you open the tool and prove it has no blade it’s still a judgment call on the part of the TSA agent. So it’s up to you whether you risk it. 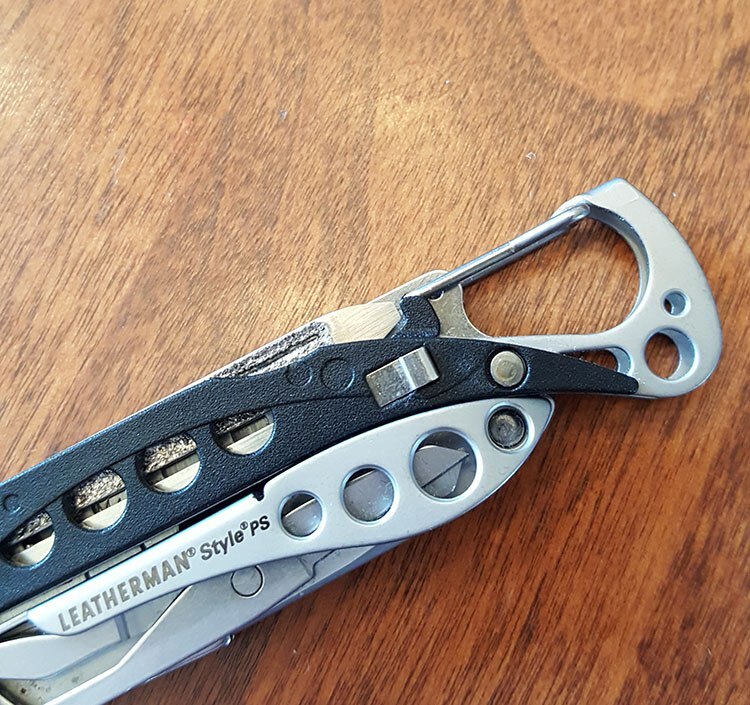 Leatherman will not send you a replacement if your Style PS is confiscated. The Style PS has been a blast to review. 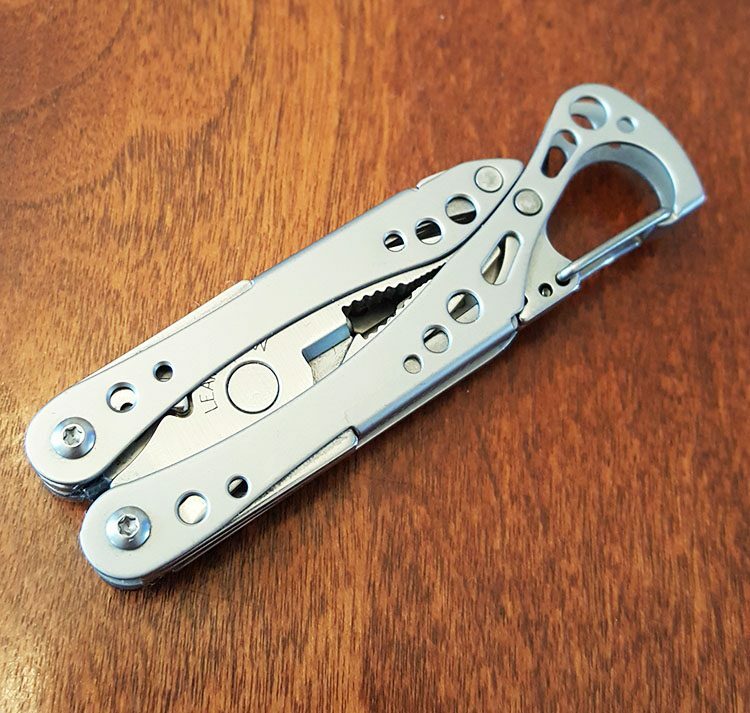 I’ve carried it everywhere and use it daily for so many small jobs that I’ve lost count from replacing a light switch cover to opening my Shock Tops to cutting gum out of my kids hair. 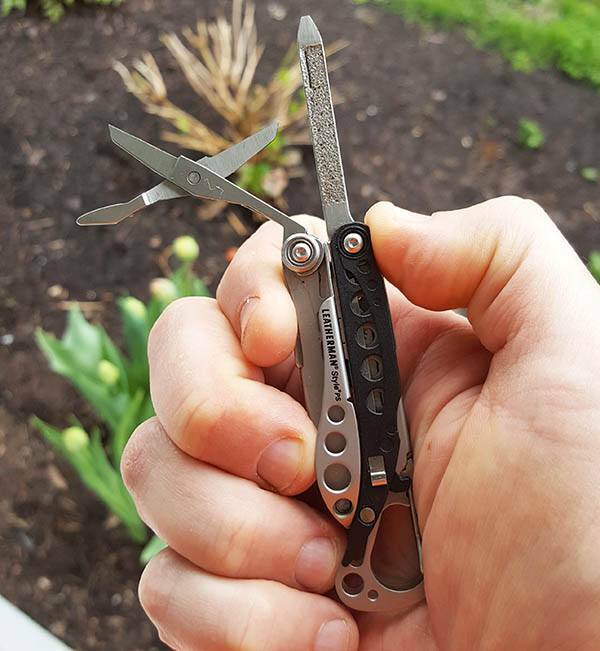 It’s definitely worth the money and I would recommend it to anyone looking for an ultra-compact multi tool. 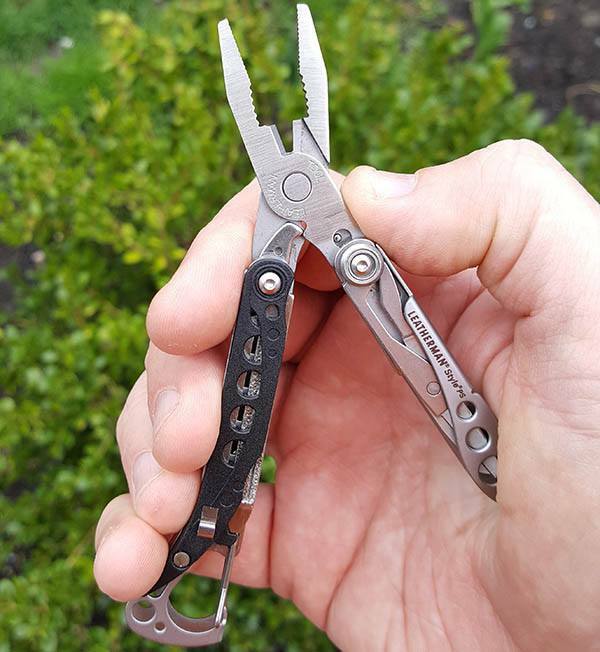 You can find the Leatherman Style PS for around $25 at our favorite stores. As always thanks for taking the time to visit Gear Cloud. We hope this article was of help, if you have any questions or comments feel free to drop us a line. 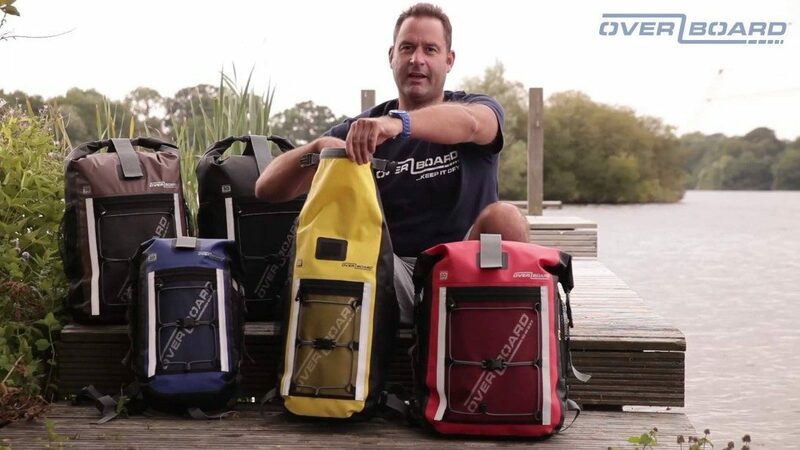 PreviousThe Big River Dry Bag…Can You Trust it With Your Gear? NextThe Campsaver Shed, A Little Known Address for Massive Deals.